Are stripes ever really not on trend? I think not. They're super easy to throw on, extremely versatile and can be worn with almost everything. From subtle nautical stripes to contrasting colours and prints, adding some texture to my wardrobe is getting me in that Spring mood (which I desperately need as January blues are hitting me hard!). Stripes had a strong presence on the runways of these last fashion weeks. Vertical, horizontal, diagonal, pinstripe, dashed; all kinds of different versions went down the runways and it is fair to say stripes will be a major spring/ summer 2018 print trend (and I'm already wearing it now!). 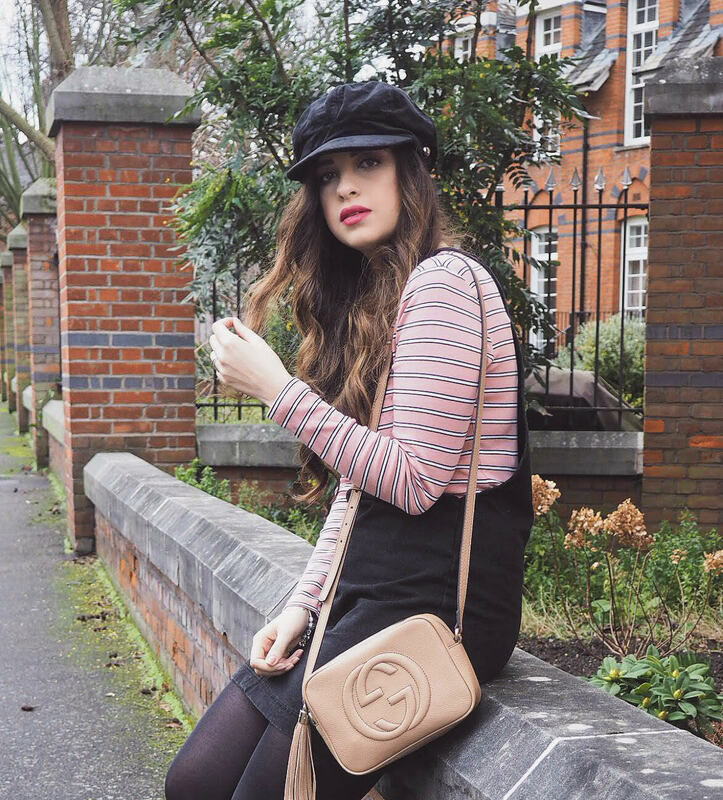 Here's a very 90s look I created with stripes, a pinafore, the hat everyone wants and the newest addition to my wardrobe, my Gucci Soho disco bag! I don't know what it is, but perhaps I should blame Friends being available on Netflix for making me want to dress in 90s fashion trends. Season 1 has been giving me all of these fashion inspirations and I had been after a pinafore for a while. I styled a blue denim one a while back here but I've given that away now as it was very short on me and uncomfortable, and I couldn't really get much wear out of it as all I could think to pair it with was a white top (been there done that). I wanted a black denim pinafore instead and I had seen one in Matalan without the front pockets, which I prefer, so I treated myself on my birthday and got it. I tried it on this past weekend when it wasn't too cold and I'm loving how it looks on me. Albeit, still a tiny bit short (story of my life...I'm tall, what can I do) but I can get away with it and I'm excited to wear it for spring and summer too with a t-shirt and sneakers. 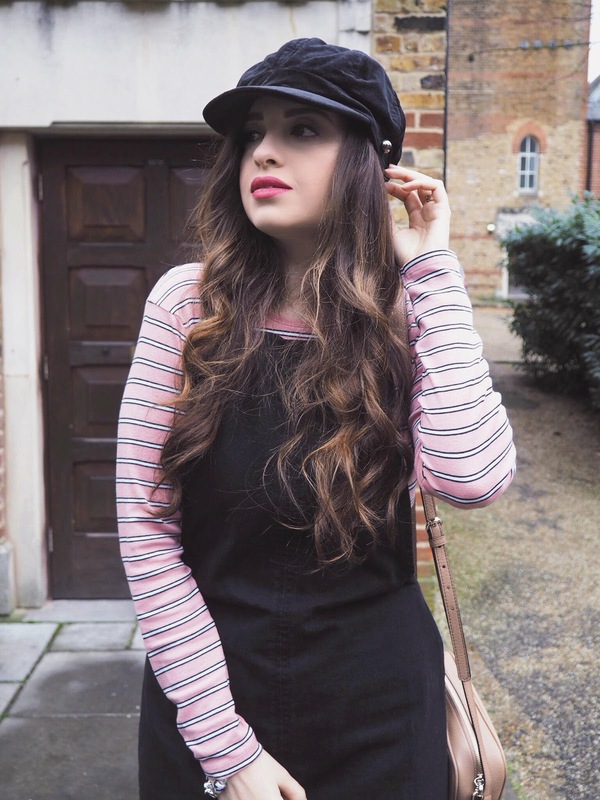 To add to the outfit, I went for a stripy simple long sleeved top and the baker boy hat, both of which made the look incredibly French, don't you think? My bag of choice had to be my latest wardrobe addition and what can I say, I'm in love and no I will not put it down anytime soon! I had been wanting a Gucci bag for a few months and after a lot of reviews read and Youtube videos watched, I settled on the Soho Disco style in Rose Beige Leather. I have far too many black bags, including a few designer ones, plus Spring is almost here (she says hopefully) and I thought beige would be a nice alternative. I was a little scared I wouldn't be able to wear it much until then but if you've seen my latest Insta posts, you will know I am obsessed and wearing it on repeat. 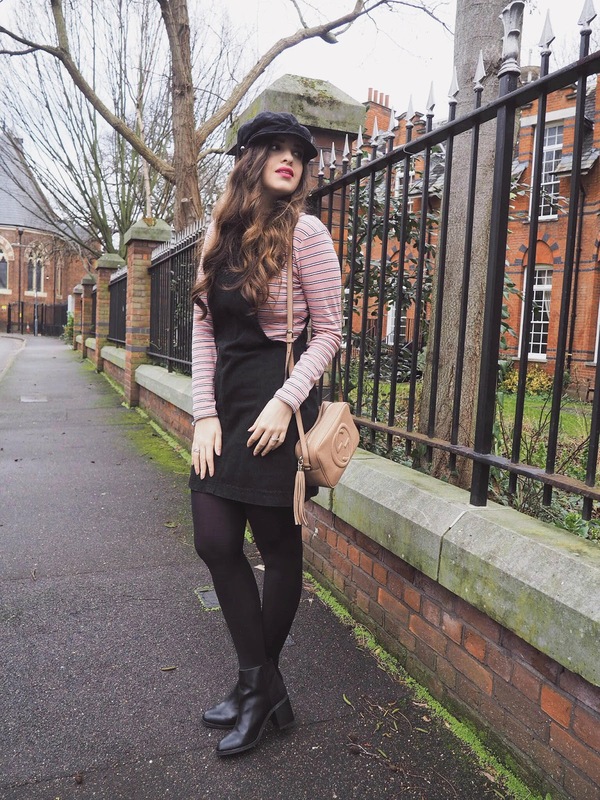 Thoughts on stripes, pinafores and my new bag? Let me know below! Me encanta el pichy que llevas y la combinación entera, la verdad que me lo pondría tal cual. Un besazo. I liked the beige Gucci bag and I loved the dress, like you said, that you were willing to dress something like the 90s :) thanks to Friends :) I love that, because mid 90s, late 90s, that's when my "real" life began :) (Ok, going to school and so on is life, too, but... not completely, for me :) So I loved the dress, the boots, the hat! For me it would be long, I am quite short - 5'2 and a half and I insist on that precious half :) Then I say 5'3 to round it up :) You look always very beautiful! So I was in your city??? W-o-w! If I had known, would have brought something for you! I am planning to go again, who knows, it's so gi-normous and incredible, so many things were missing :( Hope you have a nice week! Hugs! 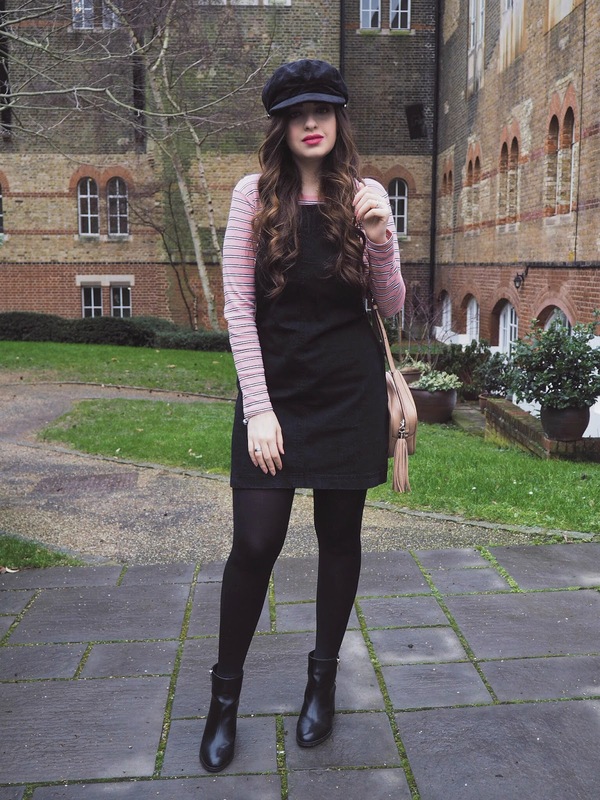 I love the pinafore outfit but I do think I am a little too mature for the trend. You look gorgeous, Pam! Looking gorgeous!! I love how you paired the striped pink top with the overalls. Such a gorgeous bag and nice outfit! You look so chic! Love the stripes and your Gucci bag is adorable. You look so pretty in this outfit. Your style is so classic and lovely! Wish I was tall and had the problem of clothes being too short on me! Haha. Looks great! You look so cute and chic Pam. The stripes top and everything are peft! This is such a gorgeous look!! I love the pink stripes!! thank you! best thing is, the tee was only a fiver! Cool pictures and what a pretty bag!! You look lovely! The hat is perfect and the bag too! You look such a darling here dear! Such a sweet and chic looking outfit. Love the stripe sweater underneath the short black dress.